On Friday, amidst the noise and childish chaos of our home, I was witness to one of the most beautiful sounds a mama can ever hear. It was the sound of a sweetly beating heart nestled inside my womb. I have heard this sound seven times, now, and each time, I am more grateful. 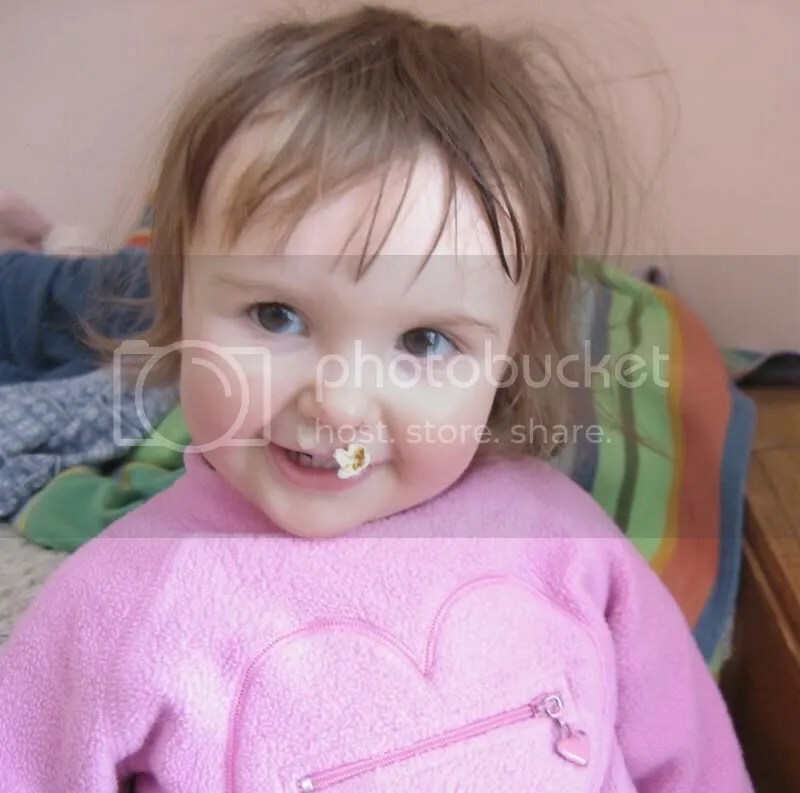 How could my Lord think that I am worthy or able to care for another unique and precious little person, an eternal soul? As long as I live, I will never understand, but I am desperately grateful. As you know, our last little one was never to be a baby we would hold. While our time spent together was special and without regret, until Friday at about 2pm, I kept my heart guarded so that if this baby would join his brother or sister in Heaven, it would be easier for me to accept. But, now that I have heard that beautiful, strong, steady beat, my heart is rendered completely vulnerable. I am wholly and completely in love. I love you, little baby. Lord willing, I will hold you in my arms in October. Until then, I hold your little heart inside me and although you don’t understand, you hold my heart, too. Back in the day when we only had 4 children, I found myself wondering if there was an alternative to spending a bunch of money on haircuts every 2 months. I asked my friend, then a mom of 6 (now of 9), what their family did. She said they cut the children’s hair at home. Aha! I immediately decided that’s what I would do, too. Afterall, how much would a 4-year-old complain if her hair wasn’t salon-perfect? I finally took the hint that I’d better get around to cutting her hair when, the other day, she trimmed her own bangs saying, “I couldn’t see!” Oops! I have been cutting my family’s hair for several years, now. 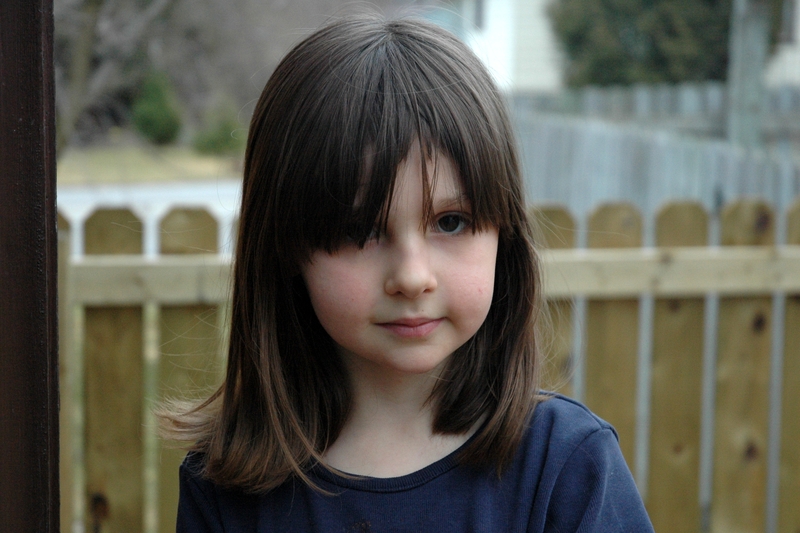 Even my teenage daughter will trust me to cut her hair once in a while. 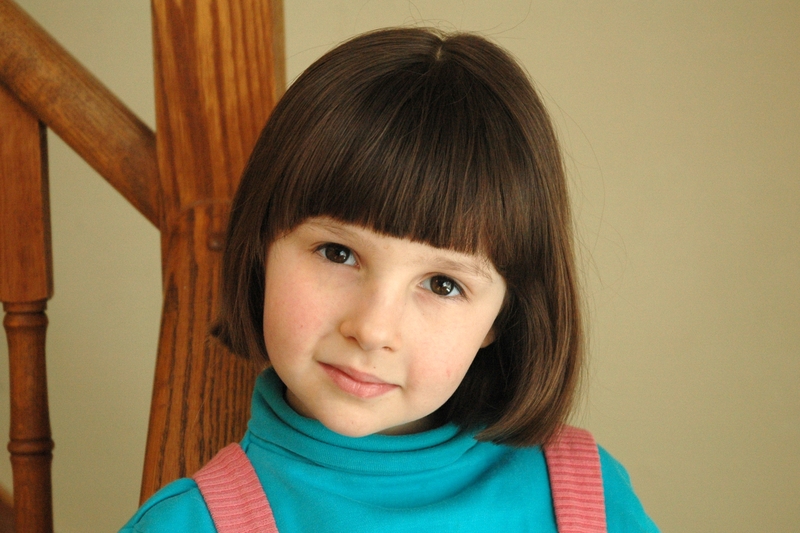 I don’t have a very wide range of skills, but I can manage trims, basic guy cuts and little girl ‘bobs’, like the cut I gave my daughter, which I think looks good on most little girls. 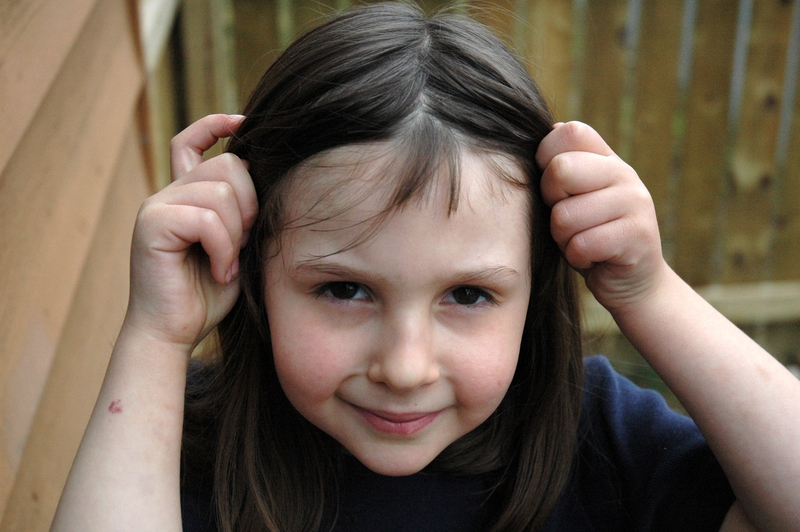 My main challenge is taking the time to actually do a cut…as my daughter demonstrated above with her self-cut bangs. I thought you might like to know what tools I find helpful to do our family’s haircutting at home. 1. 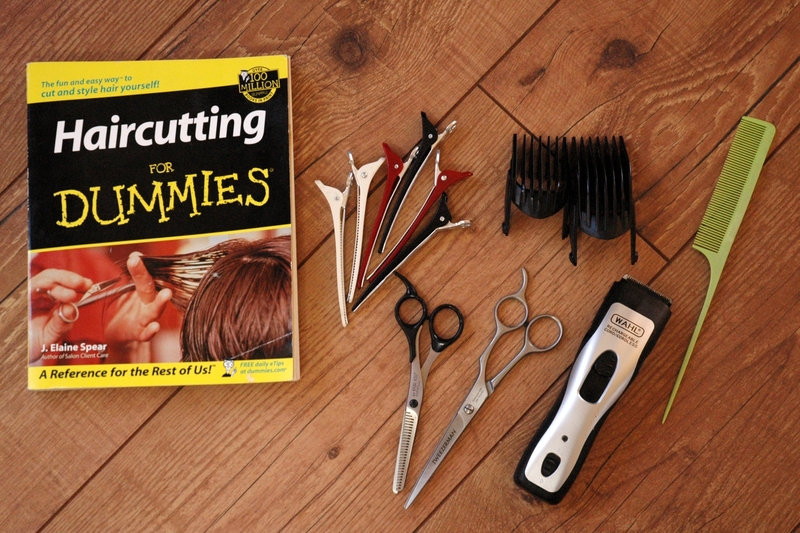 Haircutting for Dummies by J. Elaine Spear: I learned all I needed to know from watching stylists cut our hair and from this book. I am not married to this particular book, however, so I would say that any decent basic haircutting book for non-professionals would do. 2. Good Barber Scissors: We got ours from a local Beauty Supply Store. Don’t bother with the ones included in your Electric Clipper kit especially if you have a department store kit. They are not good at all. 3. Electric Clippers: We just upgraded a bit from an inexpensive kit at Costco to a clipper from the Beauty Supply Store, where we paid in the neighbourhood of $45. It didn’t have an extras like clips or scissors, but I much prefer to buy those things separately and have my money go toward making the clippers good. Ours is rechargeable and cordless, which is very nice to have. It is also adjustable, so only has 2 attachments. 4. Good Quality Clips: I think ours are usually called, ‘Section Clips’, but I often see them just called clips. Again, the ones with the cheaper clipper kits won’t do a good job of holding the hair up. 5. Tail comb: Ours is just a cheap one. It is really just the pointy end I use, anyway, for sectioning hair. 6. Thinning Shears: Optional for many people, but both Steve and I have tons of thick hair, so our children have been very blessed in the hair department. For us, this is a must have item for anyone about 8 years+. The only other thing I would like to have is a decent barber cape. It would make a nice alternative to using towels that get all hairy. When I tell people I cut my family’s hair, they often ask if one of them cuts my hair. No way. I go to the salon. Do you have times when you are overly stressed out about projects hanging over your head? Times when you are simply over-tired and dragging? Times when you just feel dull and need a change of pace? Maybe it is time for a break from your normal homeschool routine. Even though we just finished a lovely and restful week off while Steve was home from work for March Break, by Saturday night, I knew we still needed another week to complete some projects, do some preparation for next year’s homeschool and work on some Spring cleaning. When I am at the point that I realize we need some time off, I have two choices. I can either press ahead without taking the needed time off or I can plan for an effective week. 1. Decide the purpose of your time off. Is it home management time you are needing (clearing up some projects, decluttering, getting a garden ready for Spring)? Are you or your children desperate for some rest and relaxation? (I know…who isn’t? We’re talking about more than the usual tired, here.) Are you just feeling kind of stale and need something different to perk things up? (This is a pretty typical November or February/Early March sentiment.) Since we just had a nice rest last week, what we needed this week was focussed home management time. 2. Decide the length of time off you need. Generally, this will be either a day or a week. However, when I have a baby, I plan ahead to take 6 weeks off. We decided to go for a full week this week partly because of the amount of things that needed doing and partly because toward the end of the week, our homeschool would be disrupted anyway with 1/2 the children going off to visit Grammy overnight. 3. Plan your time. Now that you have determined generally why you are taking time off, decide the specifics. Are you resting? You might plan to stay in your P.J.’s until noon and read some blogs or pick up a novel to linger over. (Maybe you are not as relaxation-challenged as I am, but I find that if I plan to relax, I feel less guilty that if I just don’t manage to do my normal routine.) If you are taking ‘Change of Pace’ time, plan ahead for whatever you are going to do. We like to sometimes simply visit another branch of our library. We have several that are about a 1/2 hour drive from our home, so it is an ‘event’ to visit one. We can all choose from a different selection of books, take some home and return them to our home branch — for FREE! Maybe you want to head out for an entire morning at a park or do something on a bigger scale such as visiting a Science Centre or a Museum. Home management time off needs the most preparation, but will be very rewarding, too. I just open my notebook to a fresh page and start listing out the things I want to get done. I try not to overplan (I want to feel successful, afterall!). Once I have a good idea of what I want to get done, I schedule in my activities by writing them down on a specific plan. I also made a list of ‘service opportunities’ for the children so that they would be making a good contribution this week. 4. Plan your meals. Don’t overthink this step or hyperventilate at the suggestion if you are not a meal-planner. Simply think about meals that will fit in well with your plan. Meals for resting should be very simple and, if possible, prepared by children. I usually look after dinner and assign children to breakfast and lunch. If you are taking ‘Change of Pace’ time and are going to be heading out to a museum or a park, plan food that can be toted along if you want to avoid buying while out. Or, plan ahead to go out for lunch or to pick up bagels and cream cheese when you are on the go. (Pack some snacks, napkins, knives and water.) If it is home management time, do yourself a favour and plan a simple crockpot meal for dinner. 5. Communicate your plan. I like to wait to let our children know we are taking time off from school until I am clear about the when, why and what. Otherwise, they will just think it is a free-for-all and will not be happy when I start doling out extra chores. This week, the children clearly understood that we would be working. The list of jobs that need to be done are clearly written down in my notebook and during work-time chunks, they may simply pick something to do. As you can see, my list is conservative and also more sparse toward the end of the week. This is good because as you can also see, I only got one thing on my list done yesterday. When I plan fewer things toward the end of the week, things I don’t get done are easily shifted along. While you can never learn all there is to know — or even most of it — after you parent awhile, you do learn a thing or two. One thing I have learned is to use the wisdom shared by fellow mamas. Today, I would like to share some of my real-life wisdom with you in the form of an important parenting tip. I also have an accompanying photo, taken by me three years ago of my then 15-month-old. But, look at your own risk. It is not for the faint of heart. TIP: If your toddler has a cold, don’t serve popcorn for a snack.